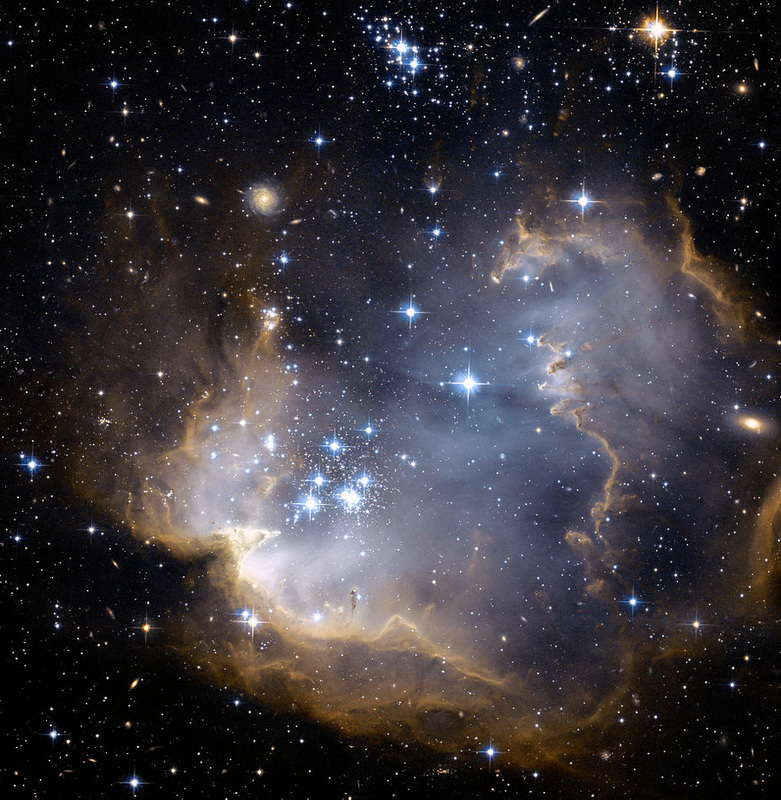 NGC 602 is a young, bright star cluster at the edge of the Small Magellanic Cloud about 200,000 light years distant. These are pre-Main Sequence stars with 0.6 � 3 solar masses that formed as recently as 5 My ago.� The star cluster is in the bright emission region near the bottom center of the above image. North is up and East is toward the left in this 29� x 29� field. 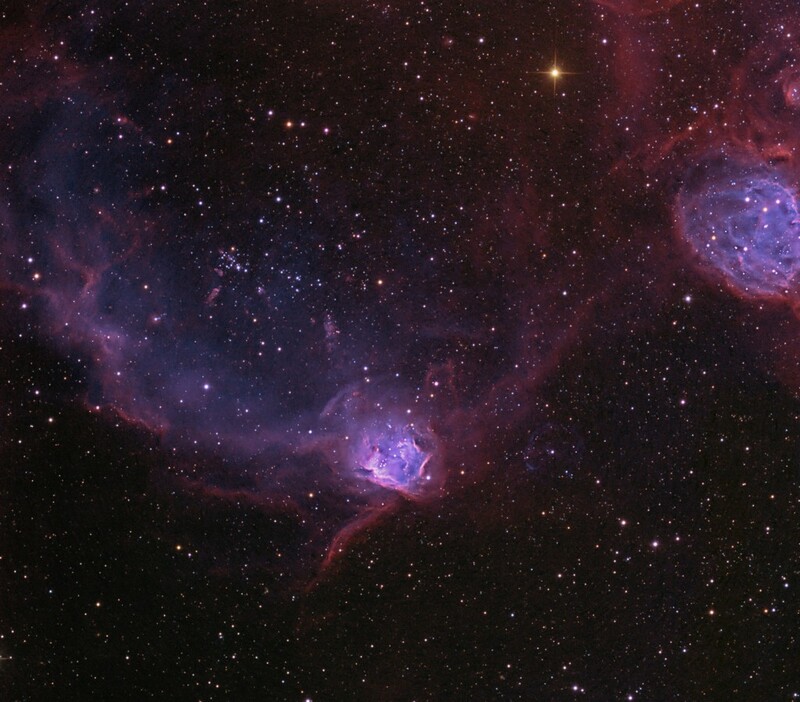 The bright emission nebula that surrounds this star cluster is referred to as N90.� The emission �wings� extending away from N90/NGC602 are part of DEM S167.� It looks like a Flying�Lizard to me where N90 is the head. An exquisite close-up image�of this bright region was presented in the Hubble Space Telescope image, where ridges and dust columns are clearly detailed, arising as shock fronts and from sculpting due to radiation from the star cluster. The HST�image is presented below (NASA, ESA, and the� Hubble Heritage Team STScI/AURA – ESA�Collaboration). Halfway between N90 and the right side in the image above is the Be/X-Ray pulsar binary (SXP 1062) that was only recently discovered in 2012 (V. Henault-Brunet et al. MNRAS (Feb, 2012) 420(1): L13-L17) at� RA (2000.0) 1h 27m 46s DEC (2000.0) -73d 32m 56s).��� The classification is B0 � 0.5IIIe spectral type.� It is surrounded by a faint, spherical 1.8 arcminute diameter shell shown in my image above that is considered to be a supernova remnant (MCSNR J0127-7332) which I wll call the Blue Ink Bubble. 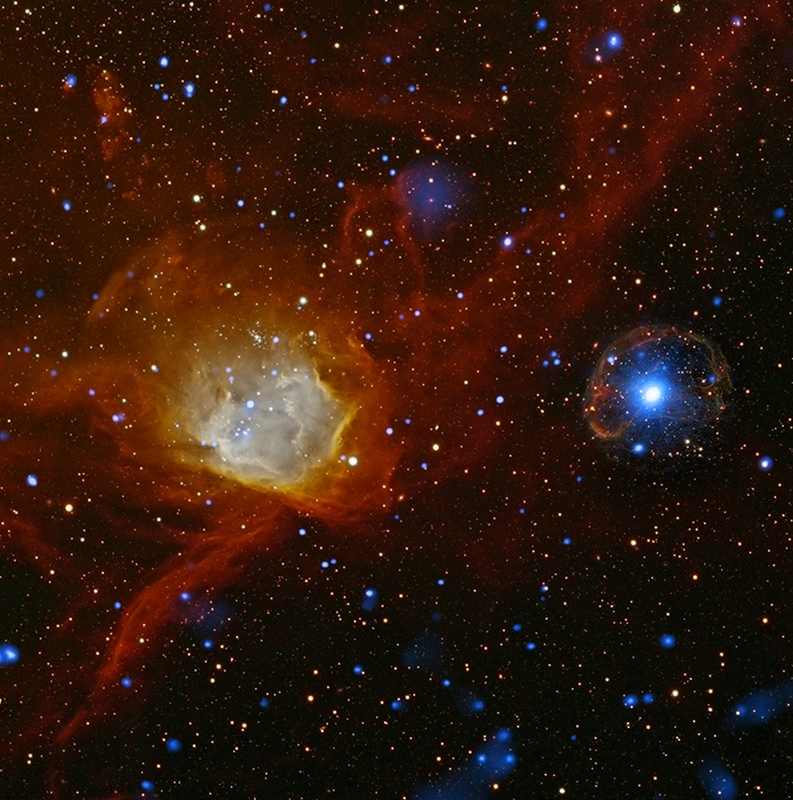 This is also shown in a composite image from ESA below using visible narrowband data from Cerro Tololo and X-Ray data from the Chandra and XMM-Newton satellites.� SXP 1062 accretes mass from its stellar companion, a hot, blue, �Be� star, where the two stars from a Be/X-Ray binary.� If this supernova remnant is related to the explosion that created this new X-Ray pulsar, it�s kinematic age is 20,000 � 40,000 years. Copyright: X-ray: NASA/CXC/Univ.Potsdam/L. Oskinova et al & ESA/XMM-Newton; Optical: AURA/NOAO/CTIO/Univ.Potsdam/L. Oskinova et al. Deep narrowband data from 5 nm H-a + [NII] and 3 nm OIII were taken to bring out the structure and faint detail. These data were processed to produce “natural color”. RGB data were added for star colors. 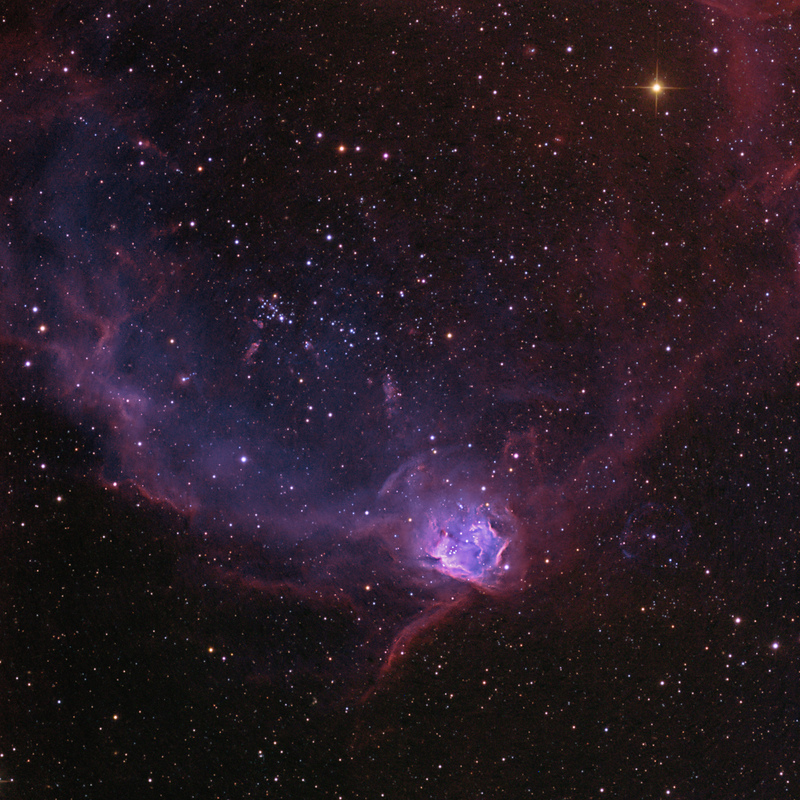 A wider field is presented below, which also includes the bright emission nebula, N89, toward the upper right (northwest). How much detail would one lose by imaging this region in LRGB only, for an equivalent amount of time? Or in half that time? Can you provide a sample LRGB image? The contrast improvement using narrowband filters is huge and LRGB filters simply cannot achieve that. I’ve discussed this in many of my talks, showing comparisons of long LRGB images compared to narrowband images. The Crescent is one example. You simply cannot get the fine structure that narrowbands provide. The stars and background in this image are taken with 1.5 hours of RGB primarily to get G2V-calibrated star colors. I then add the deep narrowband data for nebular detail. You can only see hints of the nebula structure in the RGB. Of course, you’re looking at 23 hours of narrowband data taken with 3o-minute exposures on a 20″ telescope. In short, there is no comparison. Hope this helps.